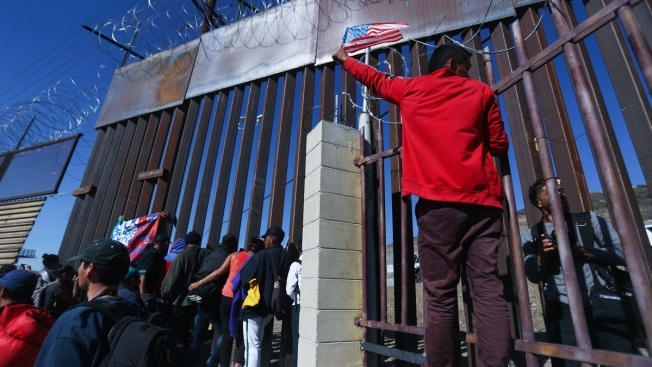 This Nov. 25, 2018, file photo shows a migrant from Honduras wave the American flag while standing with other migrants at the U.S.-Mexico border fence, in Tijuana, Mexico, where they were aiming to apply for asylum from the U.S. government. A divided Supreme Court won't let the Trump administration begin enforcing a ban on asylum for any immigrants who illegally cross the U.S.-Mexico border. Chief Justice John Roberts joined his four more liberal colleagues Friday in ruling against the administration in the very case in which President Donald Trump had derided the "Obama judge" who first blocked the asylum policy. Justice Ruth Bader Ginsburg voted from her hospital bed to refuse to let the government enforce President Trump's proposed restriction on asylum, NBC News learned. New Justice Brett Kavanaugh and three other conservative justices sided with the administration. An order from a federal judge overnight barred the Trump administration from blocking asylum requests from migrants who cross the U.S.-Mexico border illegally. 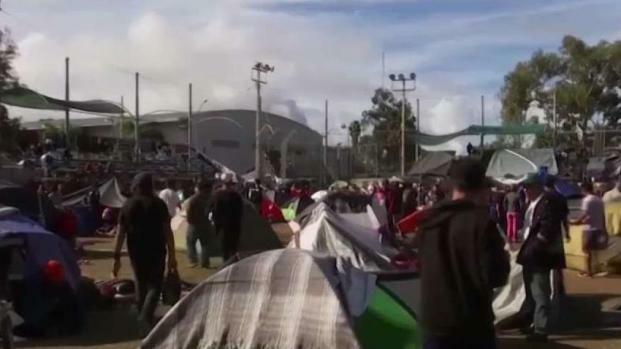 This happens as a caravan criticized by President Donald Trump arrived in Tijuana, Mexico, across the border from San Diego. There were no opinions explaining either side's votes. The court's order leaves in place lower court rulings that blocked Trump's proclamation in November automatically denying asylum to people who enter the country from Mexico without going through official border crossings. Trump said he was acting in response to caravans of migrants making their way to the border. The administration had also complained that the nationwide order preventing the policy from taking effect was too broad. But the court also rejected the administration's suggestion for narrowing it. Lee Gelernt, an American Civil Liberties Union leading the court challenge, said the high court's decision "will save lives and keep vulnerable families and children from persecution. We are pleased the court refused to allow the administration to short-circuit the usual appellate process." The high court action followed a ruling Wednesday by U.S. District Judge Jon Tigar that kept the ban on hold pending the outcome of a lawsuit challenging it. The case could take months to resolve. The ban conflicts with an immigration law that says immigrants can apply for asylum regardless of how they enter the U.S., Tigar said. In the first court ruling on the issue, Tigar said on Nov. 19 that U.S. law allows immigrants to request asylum regardless of whether they entered the country legally. The ruling prompted Trump's criticism of Tigar as an "Obama judge" and led to an unusual public dispute between Trump and Roberts, who rebuked the president with a statement defending the judiciary's independence. Tigar was nominated for the federal bench by President Barack Obama.